People with indigo or have indigo in their aura’s are sensitive and emotional, they relate with ease to all people. To be able to walk in another persons footsteps is a rare talent, to be able to see where the footprints come from and where they lead is a talent extended to very few people. To have indigo in the aura is a cherished thing and a rarely appreciated jewel, these people should be protected and encouraged, their selfless devotion to all living things is to be accepted.. not understood. The Auras when shining indigo or whether glowing purple are almost too close to call, and yet the comparison should never be made. An indigo aura will bring the insight and foresight of those most deserving, to be able to see, to be able to understand that seeing all is not about perceptions of truths. The purple in the aura is about enlightenment, understanding all things. A Pine tree “Ailim” will see great distance, the mighty Elm “Ailim” will shelter and reveal what can be seen with each giving away the secrets of mindfulness. Aloe Vera & Eucalyptus also share the purple haze that can be seen around the Pine and the Elm, to be able to sit and share, to enjoy the gifts bestowed upon one. As humans one of our greatest attributes is our imagination but one of our biggest hindrances is the suppression of the imagination in order to conform to a regimented way of thinking. To be able to think in a fashion that defies logic to behave in a supernatural state of mind is the most natural thing for us to do but is the thing that as adults we have forgotten how to do. Instead of thinking with the brain and using the brain to evaluate and draw conclusion… Think with the heart, as the heart beats and you feel your heartbeat, it does not require you to think about the next beat for it to happen, you do not need to think about the last beat to know that it did happen, a wise old shaman told me the secret of life… she said get out of your mind and into your heart… and share what is there! The indigo aura is about perception, the link to what was, to what is, to what will be. By understanding what is now, the past becomes the future, and the future the past. People with a strong indigo influence will be empathetic, sensitive to other energies and be able to relate to others easily, often without realising and will frequently cause inadvertent offence to other sensitive people who are fearful. People with indigo auras are rarely fearful and have difficulty understanding the concept of fear possibly one of the more well known people who have Indigo/Purple in their aura is Jesus. The Indigo/Purple/Blue and the varying shades in the aura are dependent on the third eye, just as the third eye is dependent on the shades of Indigo being present in the aura. The comfort of knowing allows this colour to flow and increase, just as water at the top of a mountain will find the easiest route down, the indigo in an aura will do the same… it will find the easiest route to flow and increase and gain the momentum to make itself visible to all who choose to see. With all the chakras in balance, this aura flows with ease. If the chakras are out of balance just as the shades of an Elm tree become one, the shades and density of this aura will bring the chakras into alignment. To sleep under a full moon or to find shelter in the middle of a storm will bring the chakras and etheric body into alignment. Just as one drop of oil can ruin a barrel, one negative deed can ruin this aura. Indigo children are an evolved species of human, they are revealing themselves slowly and being revered and honoured as we acknowledge that they are around. The Obamas both Barack and Michelle are indigo children who have been recognised, their aura has touched millions of people. The Dalai Lama is another indigo child who has touched and influenced millions of auras across the globe. To accept that indigo children have grown into adults, to accept that rainbow children are among us, as children and adults. To be able to see without fear into the future and how we are able to influence our surroundings with our actions, thoughts and deeds, to be able to do all of this without fear or trepidation will encourage the etheric fields, the auras and energies to prosper. The chakras will balance with ease and the auras will touch, stimulating and encouraging the indigo within to balance and flow. Like water coming down a mountain it will find its easiest route and it will gather at the bottom. Totem Entities: Unicorn, Arch-Angel Michael. The Aura should be considered as a muscle and as such should be looked after and respected. Without regular maintenance the aura can become tired and can physically show the signs of old age, with holes appearing, spaces between the fields developing and colours fading and mingling where they shouldn’t. 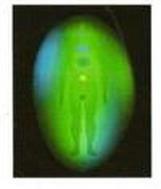 The aura should be considered as a part of our physical body and as such should be looked after and respected. Understanding and inviting naturally occurring synchronicities into our life force streams will enhance and develop our whole being and by looking after our aura, our lives improve and will continue to do so.